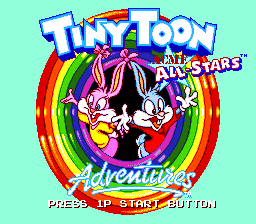 Tiny Toon Adventures: ACME All-Stars is a sports game featuring the cast of Tiny Toon Adventures. It was released exclusively for the Sega Mega Drive in 1994. ACME All-Stars is a compilation of sports games, with added Tiny Toon twists such as extra obstacles and special moves. The two main attractions are soccer and basketball modes, though simpler obstacle course, bowling and "Montana hitting" activities also feature. Soccer and basketball have more-or-less the same controls - when the player has the ball shoots and passes, and when he/she doesn't, tackles and switches character. Each character has a power meter which recovers over the game - if it is full and the user presses , the character will perform its special move. Some pitches/arenas offer extra challenges such as rolling barrels in the "Western" themed stage. A simplified four-on-four version of football, with no fouls, offsides or penalties. While the player can choose a goalkeeper, it is controlled entirely by the computer. A similarly simplified three-on-three version of basketball. A running race around a pre-determined circuit, where the player needs to regularly tap . Getting hit by obstacles slows you down, while powerups assist the player. A simple game of bowling, in which you only need to choose an angle. A four-player whack-a-mole game in which the objective is to hit as many Montana Maxes as possible within the time limit. Points are deducted for hitting Elmyra or Dizzy Devil. Main article: Tiny Toon Adventures: ACME All-Stars/Magazine articles.